I know many Haitians on the countryside of Haiti who have sold their land to send their sons and daughters to Chile hoping for a better life. Anpil Haitien di: Haiti: Peyi sa pa ofri anyen, CHILI tèt dwat. Kantite Haitien kap pile teritwa Chili disit fen lane 2017 la ap depase 100 mil. Mwen konnen anpil peyizan Haitien ki vann tè ak byen yo pou voye pitit yo Chili. Yo swete yo lavi miyò pou zanfan yo. Travel to Chile - Haitians and Venezuelans are not treated the same, why? Poukisa leta Haitien pa kreye plis job nan peyi a pou jèn nou yo sispan ale Chili? Konsidere chak ayisyen pati ak $1000.00 poch plis transpo sa fè n pa di ayisyen an fou pito? 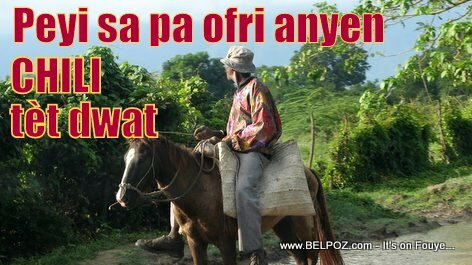 Se pa ayiti ki pa ofri anyen, se nou mem bann de bon aryen, nou vle lajan men nou pap aprann yon metyé. Jenerasyon pam lan, nou te konn fè tout metyé. Chak Haitien ki ale Chili pati ak 1000 dola kob poch pou pi piti. genyen ki ale ak 1200, 1400.